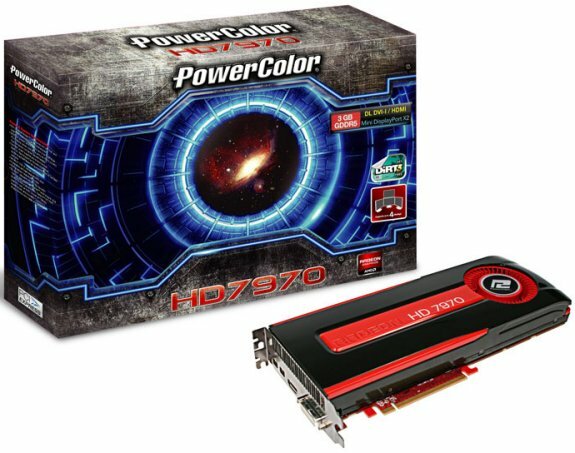 PowerColor reveals its Radeon HD 7970. It's clocked at 925MHz and has 3GB GDDR5 memory with a frequency of 5.5GHz. TUL Corporation, a leading manufacturer of AMD graphic cards, today announces a breathtaking graphics solution: the PowerColor HD7970. Based on the 28nm GCN architecture, HD7970 enables the absurdly high frame rates at demanding setting while using less power and better transistor efficiency, maximizes the most astonishing gaming performance like never before. Clocks at 925MHz core and 1375MHz memory speed, the PowerColor HD7970 can easily boost up your PC with the support of the latest PCI Express 3.0; through doubling the bandwidth per lane of previous generation, it can release the power of GPU to maximize performance while paired with the latest platform. By utilizing AMD PowerTune technology, the PowerColor HD7970 performs a real-time power draw to enable higher clocks and faster gaming; furthermore, with advanced Microsoft DirectX 11.1 and AMD HD3D Technology support, gamers can get the realistic and lifelike 3D visual effects. It’s also compatible with AMD Eyefinity technology which supports 16k x 16k maximum display group resolution, gamers can be surrounded by up to six displays to see more and feel the intense wrap-around experience. The PowerColor HD7970 also takes advantage of AMD APP Acceleration to speed up the daily applications by creating a co-processing environment of GPU and CPU, easily accelerates computationally calculations in everyday tasks such as video rendering, web browsing and office applications.